Happy Cinco de Mayo 2014! From “The Spirituality of Change” by Joyce Rupp. Image: The Aztec Eagle, from the “Codex Mendoza,” courtesy Colonial México. Today commemorates México’s independence from France in 1862, during the Battle of Puebla, in the midst of the Franco – Mexican War. It’s often confused with México’s independence from Spain, which actually occurred in 1821 and is celebrated on September 16, or Diez y Seis de Septiembre. México has the unique distinction of being the only country in the Western Hemisphere that honors its independence from two European super-powers. But, as with every other nation in this part of the world, México’s history is written in blood. And, just like the Fourth of July here in the U.S., its meaning goes far beyond mounds of food and gallons of alcoholic beverages. Above image courtesy José Sanchez Martinez. The Cinco de Mayo holiday is closely associated with 2 things: México’s independence and beer. That’s only half true. México’s actual Independence Day is September 16, Dies y Seis de Septiembre. It was on that day in 1810 that a Catholic priest, Father Miguel Hidalgo, issued a proclamation known as “El Grito de Dolores,” calling for all the people of México to unite in rebellion against Spain. It took more than a decade, but México finally achieved complete autonomy from the Spanish empire in 1821. The Cinco de Mayo affair was not as dramatic or bloody, but it’s still a significant event in Mexican history. Even after winning freedom from Spain, México struggled politically and economically to establish itself as an independent republic. 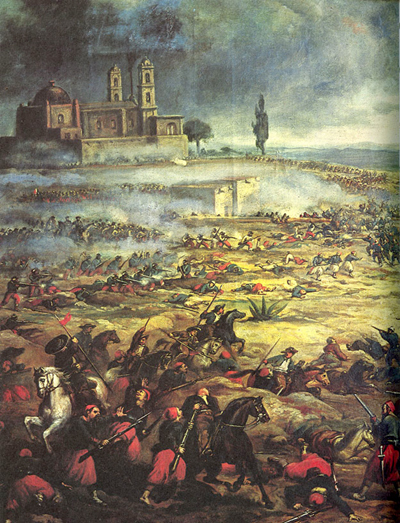 Its fiduciary weakness allowed the United States to defeat México in the Mexican-American War of 1846 – 1848 and take control of what is now the American Southwest. In 1861 President Benito Juarez – having inherited a bankrupt nation – issued a moratorium halting payments on all of México’s financial obligations. Much of that debt was owed to France. The following year Napoleon III dispatched his powerful and much-feared military to México. The French Army expected to march from the port of Veracruz to México City without much resistance. Juarez responded, however, by ordering General Ignacio Zaragoza to confront the French. Comprised mostly of Indian soldiers, the Mexican Army was poorly-equipped and outnumbered 4,700 to 5,200. Yet, when the two factions met in Puebla de Los Angeles on May 5, 1862, the French were surprised by the Mexicans’ determination and fortitude. After a bloody battle, the humiliated French were forced to retreat. Undeterred, however, the French launched another attack; this time with more enforcements. They made it to México City and ousted Juarez; installing Austria’s Emperor Maximilian as the reigning monarch of México. But, once again, the French underestimated the Mexicans’ resolve. In 1867, Juarez regained power, when he led a revolt that culminated in Maximilian’s assassination. Technically, therefore, México boasts two independence days. But, it’s Dies y Seis de Septiembre that matters the most to them. Cinco de Mayo is more of a source of national pride; that a bunch of poor, uneducated, mostly Indian soldiers were able to defeat one of the most powerful militaries on Earth at the time. But, Cinco de Mayo’s popularity in the U.S. was not born of such noble intentions. A close friend of mine told me how shocked an official at his daughter’s grade school was when he explained the real reason for Cinco de Mayo celebrations up here. Like a number of schools with large Hispanic and / or Mexican immigrant enrollments, the school honored May 5 as a cultural event; a way to help those particular students stay in touch with their heritage. Please. Cinco de Mayo became fashionable because beer companies – most notably Corona, which was introduced to America in 1981 – wanted to tap (pun intended) into the lucrative U.S. consumer market. Cinco de Mayo also precedes Memorial Day, an exclusively American holiday, which in turn, is the unofficial start of summer. And, just like Memorial Day has become synonymous with barbecues and patio furniture sales at Wal-Mart, Cinco de Mayo is now linked to beer consumption and fist fights over water volleyball games gone wrong. Besides, Cinco de Mayo is easier to pronounce than Dies y Seis de Septiembre. Some people think because I’m part Mexican Indian and my mother was born in México that I celebrate Cinco de Mayo with fervor. I don’t. Neither does my mother, or most everyone else in my family. I celebrate July 4th because that’s the United States’ Independence Day. And, that’s who I am – an American. Cinco de Mayo has about as much significance to me as a rainy Monday morning. Oh, and the aforementioned school official? My friend told me they put a stop to Cinco de Mayo festivities shortly thereafter. Kids and beer really don’t go well together.